Judging from the results of online searches, the terms divorce and nasty might as well be synonyms. The Digital Age likes content presented in neat packages, so you can go online and find juicy celebrity divorce narratives in batches of five, 10 or 25. Yes, traditional divorce, in which both sides hire attorneys and essentially fight it out, is still commonplace. However, recent years have seen a rise in alternative models designed to tame the battles and ease the pain. One is mediation, in which spouses work with a neutral mediator voluntarily to resolve the issues, including distribution of property, finances and custody of children. Mediators need not be attorneys, but might be psychologists or family counselors. For the past five or six years, Cramer & Anderson Partner Ken Taylor, who focuses on Divorce & Family Law, has been engaged in a new model, a hybrid approach called collaborative divorce. Cramer & Anderson Partner Ken Taylor. In this approach, an attorney represents each of the partners, but both agree to work toward a resolution collaboratively and without resorting to court. The process begins with the couple sitting down with the attorneys and working out mutual goals. In collaborative divorce, each attorney can speak to the other attorney’s client if all counsel is present. “It’s generally a very good process,” said Attorney Taylor, who has been professionally trained in the collaborative divorce process. “What it does is avoid the long-term scars for a family because you work on resolving their issues together.” Another attribute is that collaborative divorce can save money. 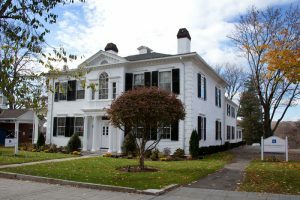 “We have a good collaborative group in Danbury that we’re just getting off the ground,” Attorney Taylor said of Collaborative Divorce Group of Western Connecticut, a group of professionals consisting of family law attorneys, therapists, psychologists and divorce financial planners in the Western Connecticut area. He is also a member of The Litchfield County Collaborative Divorce Group, founded in 2002. Attorney Taylor is equally committed to those goals. He may be reached by phone at (860) 355-2631 and by email at ktaylor@crameranderson.com. Other Cramer & Anderson attorneys who practice Divorce & Family Law include James Hirschfield, Abigail Miranda and Lisa Rivas. Cramer & Anderson has offices in New Milford, Danbury, Litchfield, Kent and Washington Depot. For more information, see the website at crameranderson.com or call the New Milford office at (860) 355-2631.